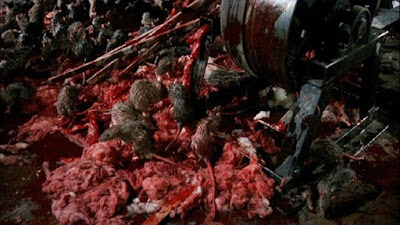 Stephen King’s “Graveyard Shift” in another scary story involving demonic animals, this time it’s rats. Released in the fall of 1990 and years after the golden era of horror films that was the 1980s. 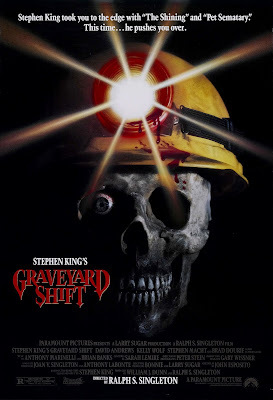 “Graveyard Shift” is shall we say one of King’s least admired adaptations. I have not read the short story on which the movie is based, but I’m sure something was probably lost in translation. As per usual the story takes place in a small New England Town. This time an old textile mill that is overrun with rats is the focus of the horrific events to come. The rats seem to work as a team and controlled by a large mutant mother rat that for some reason has large bat wings. The story is filled with colorful over the top characters starting with the Exterminator played by Brad Dourif, he is a Vietnam vet and is very into his job. He reminds me of Dale Gribble from the show “King of the Hill”. Our hero is a drifter that blows into town looking for work and the mill is looking for people to clear out their basement. John Hall is his name an he looks and acts just as bland as his name suggests, but does have a certain quiet dignity about him. The Bachman Mill as it is called is in reference to Stephen King’s writing pseudonym Richard Bachman, for which he wrote the story under. The Mill’s foreman, Warwick, is another crazy shady character who is your typical tyrannical businessman. The movies flow or lack thereof becomes an issue, it feels like it was edited by about six different people. The acting is, of course, way over the top and comical at times, we never really get to know any of the characters in any important or interesting way. What I did like though was the set design and the wet dreary atmosphere of the dilapidated mill. The pieces are there for a good movie but the execution just misses the mark completely. Our group of mill workers make their way through a series of tunnels in the bowels of the old mill each of them eventually being picked off one by one by the mutant rat-bat. We end up with John finding the creature’s lair, a giant boneyard of skeletons and leftovers. He then leads is up to the giant industrial cotton grinder and the rest writes itself. If you're in the mood for some stupid mindless horror with the Stephen King name then this is the movie for you. The early to mid-90s was a dark time for scary movies as the idea tank was bled dry. Although that being said 1990 was also the year that the two-part miniseries“It” hit T.V. screens.